You know how Kohl’s sends you those $10 off coupons sometimes? Well I’m sometimes a sucker for clearance costume jewelry. Three necklaces and two pairs of earrings for about $16!! The Dana Buchman earrings I turned into three sets of earrings. They were a bit over the top as it was with three gems and each with one gem is more wearable as daily wear. The Lauren Conrad necklace lost the tennis charm and turned into a necklace and bracelet set using the spare charms from the Chaps earrings. I left the gold and silver 3-tier necklaces as they were. So what is that… 3 necklaces, 4 sets of earrings and 1 bracelet for $16? Or $2 each piece! Now that is what I call budget shopping! And yes, I have worn each of these several times already at the time of this post. So back in 2011 I noted that denim / chambray shirts were catching my attention. Mostly paired with bright colors like coral and yellow OR with white pants / jeans. The coral jeans and yellow jeans have been something that have stuck in my mind as something I have wanted to buy for awhile now. 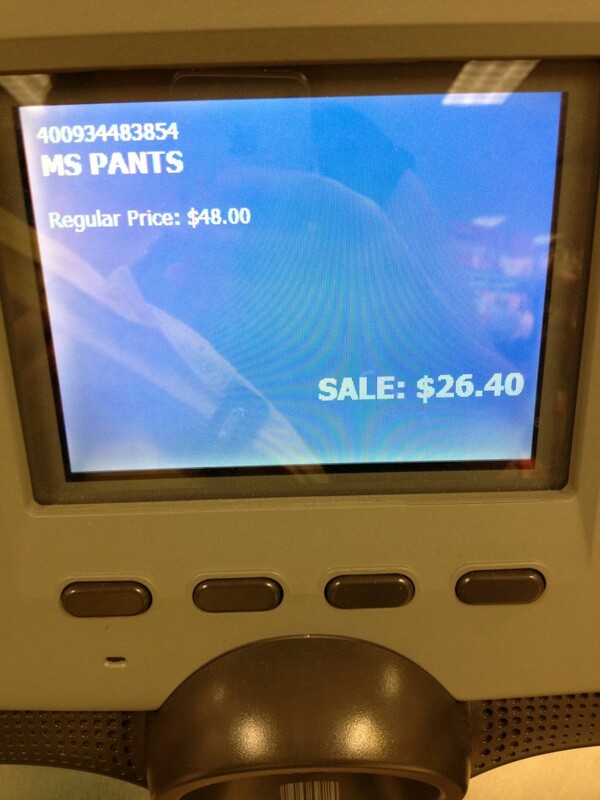 SO, today there was some shopping at Kohl’s… let’s start with the pants since they ARE what I’ve been talking about. I have no idea how they got “sateen” or “capris” out of this. Ok, so maybe my lower half sometimes works better with petite sizes but these look more like they would qualify as “ankle jeans” than “capris” even if my legs were longer. The fabric is more like jeans material but the stitching is different and they don’t look like jeans. They’re very soft and not shiny. I purchased them for $26.40 today. I’ll get to something related to the price at the end of this post. Tops shown from left to right are: ELLE™ Lace Peplum Top, Dana Buchman Solid Pleated Top, and my own top from TJ Maxx. I did not buy the shirts though I definitely want one peplum top before this trend is over. 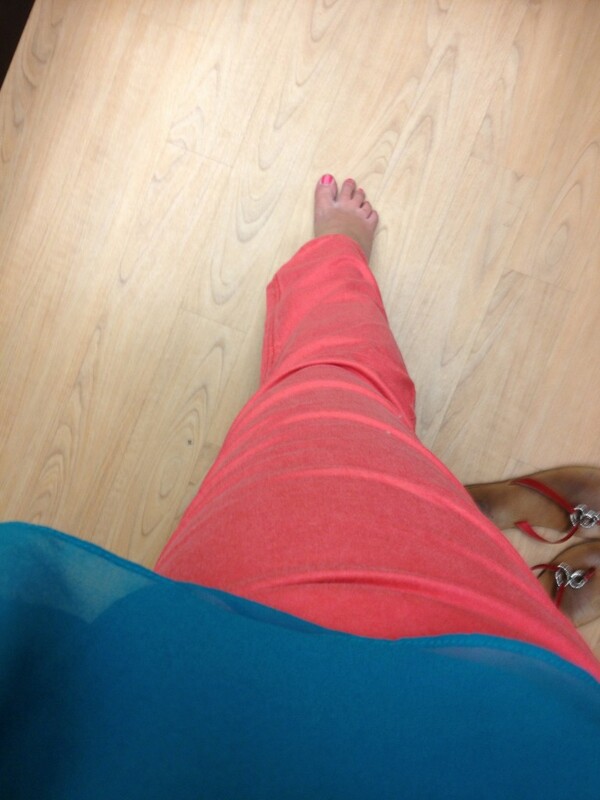 I could not for the life of me get this color to photograph well in the dressing room. I swear it’s more coral than pink … but it’s on the pinkier side of coral. These are jeans and you can tell in the photo that they are a more normal length (hence about an inch too long on me.) I’m debating whether I should hem them or just leave them as is because with shoes they won’t drag the ground. Otherwise the fit is excellent for me. So I’m looking for a turquoise dress to wear as a bridesmaid in a wedding this summer. The AB Studio Pleated Fit & Flare dress was something I had picked out online to try on and found at the local store. 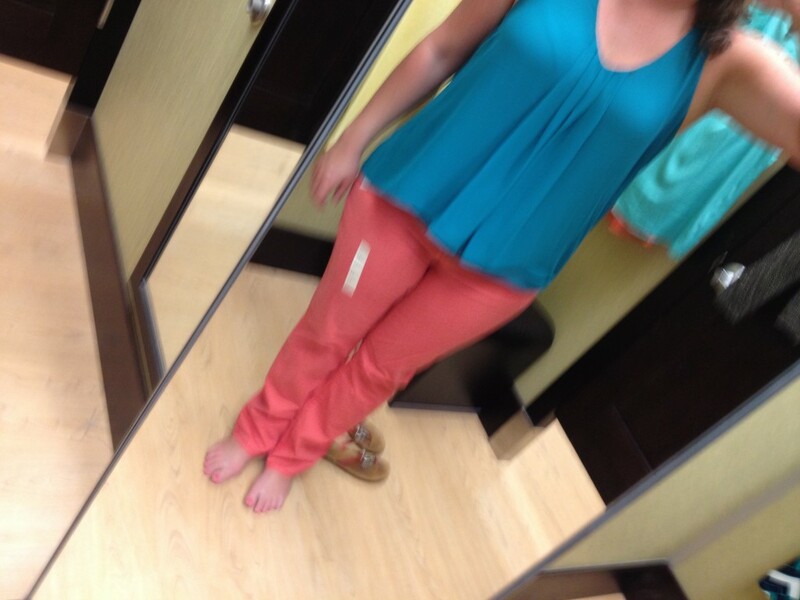 You can really see in these two photos what happens to the color in the dressing room lighting and why I could not get the correct color on the jeans above. I liked the dress but it just didn’t seem like something I should wear as a bridesmaid. It just seemed a little young and not quite dressy enough. Yes, we are on our own for bridesmaids dresses. The only bridesmaid who has said what she’s wearing has said black. I have my black dress but I feel like I need to take a more colorful dress. Yes, you’re seeing a lot of turquoise but in this case it’s one of the wedding colors. 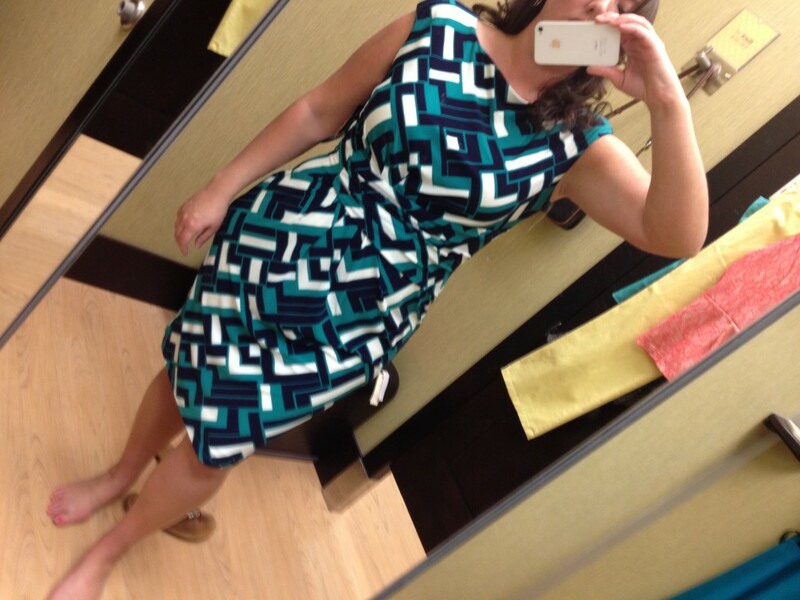 So the final verdict was a pass on this dress. Just wasn’t quite right for the occasion. This dress I tried on because I’ve been eying it for months now. I don’t think it’s right for a bridesmaids dress. Just too busy a pattern for the photographs. I do however love the fit and colors. Super comfy, hides certain flaws while accentuating curves in a flattering way. I kinda want to buy it to wear to Keeneland. Keeneland is a race track for horse races. You have to have gone to get it completely. You don’t have to dress up but the majority do… people skip work, get dressed up and go to drink and bet on horses. And people watch – that’s half the fun. It’s not quite as dressy as Derby but some people do go ahead and take it to that level. April is spring meet time at Keeneland. I almost didn’t buy any of this, even the pants. The teal dress I knew was on sale but those little electronic displays over the yellow pants didn’t have any discounts. I thought the yellow pants were going to be $48 instead of $26.40. BUT you know those little price check kiosks? YES, you should USE THEM! 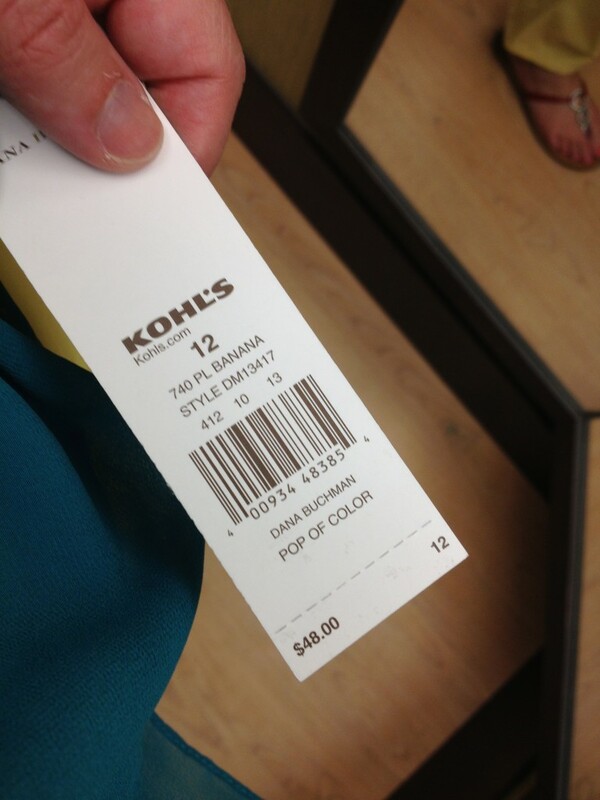 Look for the price check kiosks at Kohl’s – they are your FRIEND.